South Melbourne – home of the brothel! At least that’s what my rudimentary ‘research’ (Googling) has led me to conclude. It makes sense – South Melbourne is primarily a business district; lots of workers need to be ‘serviced’, apparently. 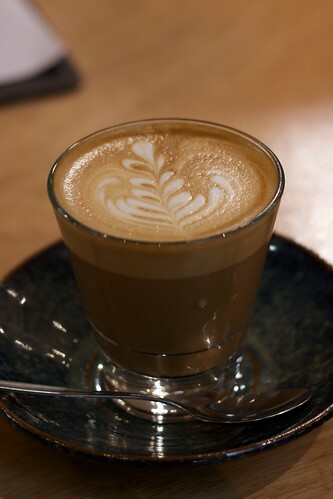 Now the only thing South Melbourne seems to have more of (than brothels) is third-wave coffee places. Between St Ali, Dead Man Espresso, Padre and a slew a smaller cafés the area’s not exactly a coffeeless wasteland. That’s why I was a little surprised when I happened upon a still-being-renovated Freestyle Espresso a few months back, whilst causing a ruckus in the back-streets of South Melbourne (read: lunch-time stroll). Once back in the office I utilised my computer to ‘research’ the venue, and seeing that its presence had already caused a disturbance in the ‘force’ (in food blogger wankster circles), I took a mental note to check back in when it had opened. Fast-forward a month, and the lovely Ms G and I were in South Melbourne, hungry and looking for breakfast action. Walking into the place it all looked rather pretty – cute little tables, polished concrete floors and pristine shelves of gourmet foodstuffs; not at all out of place amongst the more seasoned South Melbourne cafés. Happy in the place’s ‘swishness’ I moseyed on up to the counter, ordering a latte and Moroccan mint tea to wet our whistles. 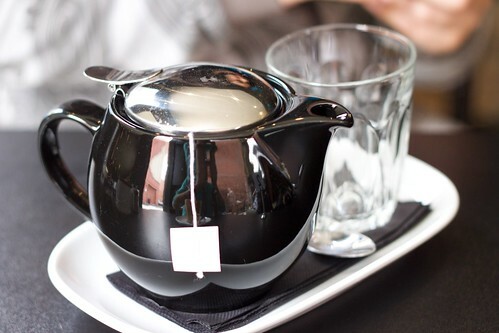 The tea as pictured above, came in a cute and oh-so-shiny teapot. 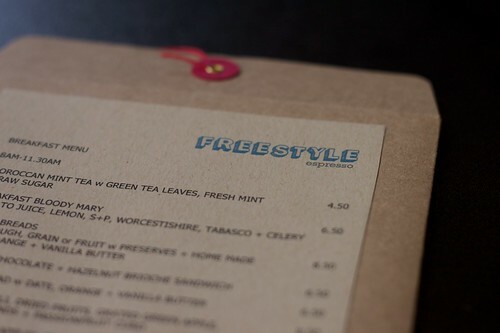 The tea itself was quite sweet and refreshing, and Ms G seemed to enjoy it immensely. Opting for my default latte (as I do when confronted with a new venue), I found the coffee to be very drinkable, but not in the same oh-my-gawd league as some of the aforementioned cafés. We grabbed some of the gorgeous menus (pictured above) and began to scrutinise them over at our table, and scrutinise we did – we were like two hipsters at an op shop, poring over piles of clothing to clad our fashionably emaciated frames, only to lock eyes on the same outrageously ‘ironic’ 80s rainbow coloured mohair cardigan. 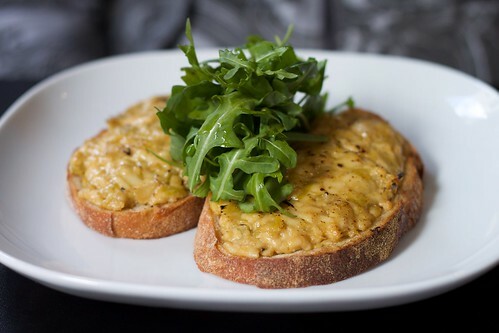 In our case the delicious ‘cardigan’ of the morning was the Welsh rarebit. Being the utter gent (or lord, as my brothers would say) I acquiesced to Ms G having the rarebit. From her account it was a tasty bit of fare, and from the mouthful I had it was a good bit of winter food. In recent times I’ve had a gaggle (or is that swarm?) 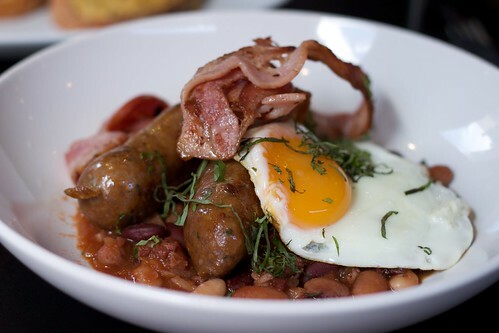 of good cassoulets (Libertine, Cafe Vue at Heide), so spotting the cassoulet with streaky bacon with the offer of an egg on top (a free set of steak knives is the home shopping equivalent) I was sold. However reality did not quite meet my home shopping network exceptions: what I was presented with was not cassoulet. It ostensibly had the cassoulet ingredients, but really tasted more like a standard breakfast of bacon, sausages, egg and beans. As Ms G noted, stewed beans with assorted other ingredients in a dish does not make cassoulet. Also, being a man of ‘large appetite’ the meal felt a little small, and could have done with a piece of sourdough or similar to hold it together. While I may have had some issues with the food, the staff were fantastic. Extremely friendly and informative, with the barista giving me a run down on their house coffee, Allpress. 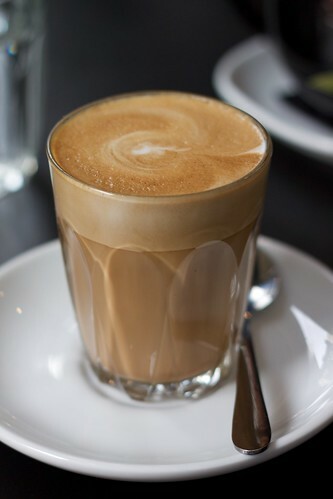 While the coffee isn’t at the same level as some others in the area, and there are a few ‘teething’ issues with food, I will most certainly be back to give the café another try. 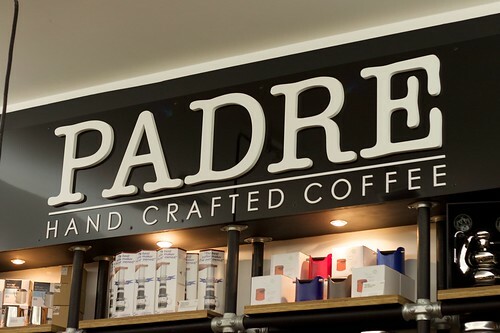 Given the lacklustre coffee at Freestyle, and the ominous ‘headlight wiper of doom’ spotted in the street (not to be confused with Indiana Jones and the Temple of Doom) Ms G and I decided to navigate the unwashed masses at South Melbourne Market and pick up a coffee at Padre. The crowds waiting for their Saturday morning fix was a good sign; I thrust Ms G into the line, requesting a latte with the house blend. It was delicious. 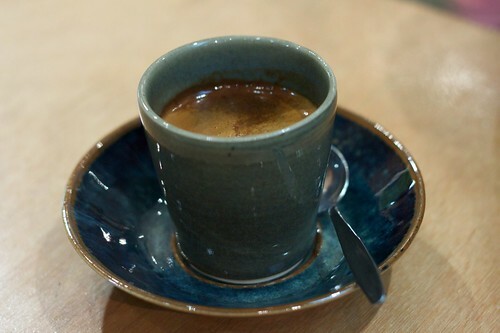 While I’m not a coffee snob (at present), I do ‘know what I like’ and this was it. I can’t recall the exact flavours, but it reminds me of the blend used at Cup of Truth. Ms G, the real man in the relationship (not to be confused with ‘The real Julia’) got a long black, delivered in a gorgeous bit of crockery. For her it wasn’t bitter, and very flavoursome in a savoury way. The wait staff seemed very attentive and efficient, even amongst the fury of Saturday morning markets. If you’re in the area on the weekend or during the market’s weekday trading hours and need your ‘fix’, this is the place for it. This entry was posted in coffee hipstery, eatie-foodies dining out and tagged breakfast, brunch, cafe, cassoulet, coffee house, Freestyle Espresso, Melbourne, Padre, South Melbourne, South Melbourne Market, third-wave coffee on August 20, 2010 by tristan.